Serif continues to surprise photographers and creatives with its Affinity apps, especially Serif Affinity Photo 1.5. Five years in the making, it was built from the ground up to be a fast, powerful, professional rival to Adobe Photoshop, but sold with a regular ‘perpetual’ licence and at a fraction of the original cost of Photoshop. Apple was impressed enough to award it Best Mac App of 2015. Launched as a Mac-only app with no immediate prospect of a Windows version, its appeal was obvious but limited. But now, with version 1.5, Serif has brought a Windows version too, with direct feature-for-feature parity and file compatibility. The two platforms can even share a file’s undo history. But Serif has gone even further, launching an iPad version which sacrifices none of the desktop app’s power, usability or controls. We’re used to mobile apps being simplified, dumbed down version of the real thing, but this is different – read our Affinity Photo for iPad review to find out why. Like Photoshop, it’s a full-on, technical image-manipulation program designed for precise and detailed editing of single images and composites. Version 1.5 does bring macros (like Photoshop Actions) and batch processing, but it’s still really a traditional in-depth editor. It’s not an all-in-one image browsing, cataloguing, organising, enhancing and sharing tool like Lightroom, and it’s not a quick and powerful effects generator like Alien Skin Exposure X2 or MacPhun Luminar. If you want image cataloguing and instant ‘looks’, then Affinity Photo is not really for you – although even this other kind of user occasionally needs more powerful compositing, masking and layering tools, and at this price anyone can afford to have Affinity Photo in their Applications folder for occasional use. Notice anything about this screenshot? That’s a Windows taskbar at the bottom! 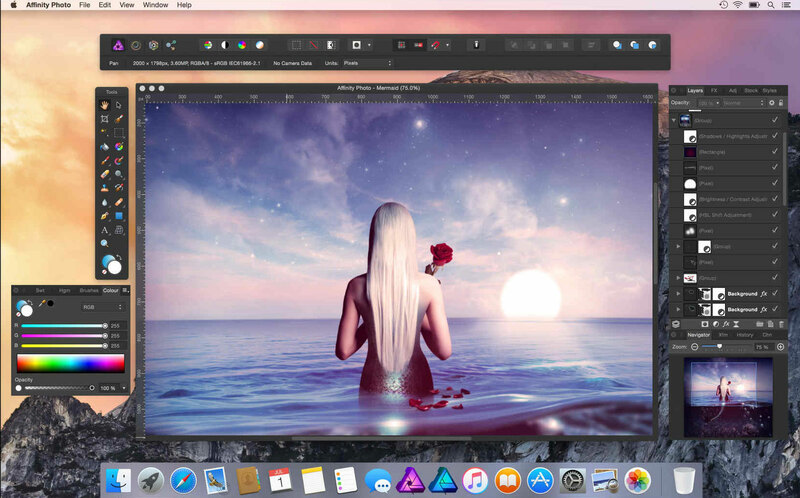 Affinity Photo is now available for both Mac and PC. I’ve taken the liberty of using Serif’s own screenshots extensively in this review because if I tried to replicate all the new and existing features with my own images we’d probably still be waiting for this review a year from now. I hope you don’t mind. First things first. If you use Affinity Photo on its own, you’ll need to navigate to your image folders using the File > Open command and old-school folder browsing. Or, if you have image cataloguing/browsing software already, such as Capture One, for example, you could configure it as an external editor. If you intend using Affinity Photo as an external editor, you would need to check for conflicts with raw files if your host program processes them itself when you wanted Affinity Photo 1.5 to do it. And you might, because this is one area that’s been improved considerably in version 1.5. The Develop (raw processing) persona now has automatic lens corrections, a wider colour gamut and ‘unbounded’ 32-bit editing, but it still takes a lot of work to get close to the results you take for granted ‘out of the box’ with other raw converters. When you open a raw file in Affinity Photo, it opens in the program’s Develop persona (each ‘persona’ is in effect a workspace dedicated to specific tasks). This is equivalent to Photoshop’s Adobe Camera Raw, but it operates within the main application window rather than in a separate one. Affinity Photo has support for 70 new camera raw formats and, perhaps more important, it now incorporates ‘thousands of automatic lens and camera body profiles for automatic lens correction. This is enabled by default, so you don’t get a checkbox as you do in Lightroom or Adobe Camera Raw. There are also manual adjustment tools, but these now operate in addition to the automatic corrections – they don’t override them. The Develop persona’s colour handling has been improved too. Previously, highly saturated colours had a tendency to clip to white much too easily, but this has now been fixed. Serif says the Develop persona now has a much wider colour gamut and operates in a 32-bit ‘unbounded’ space, and it’s now possible to export 32-bit images for editing, preserving their extended tonal range and making it available for further adjustments in the regular Photo persona. Even so, the results can sometimes look a little flat and lifeless if you’re used to rival raw converters like Lightroom or Capture One Pro, and the highlight recovery isn’t immediately impressive. There are, however, a couple of things to be aware of. First, you should try disabling the tone curve applied by default – this step gives a flatter look but makes it easier to recover highlights. Second, the Develop persona applies no default sharpening at all, which makes fine detail look pretty soft until you add in some detail enhancement. In my opinion, it’s best to keep the Develop persona only for the most basic and necessary raw processing and do most of your work in the regular Photo persona instead. Despite the improvements, however, the Develop persona can’t match the vibrant results from established rivals – at least not without considerable work. The shadow recovery in particular is pretty unimpressive, producing a rather muddy dark result rather than the instant lift you get in other software. It was also noticeably slower at opening raw files on my MacBook Pro. If this was the only raw conversion tool you had, you’d get by perfectly well, but Serif still has some work to do here to match the responsiveness and results from other raw converters. 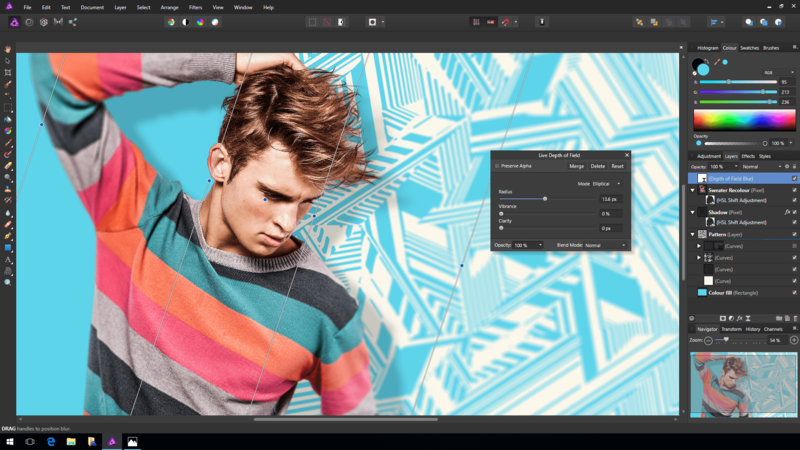 Once you’re in the regular Photo persona, Affinity Photo starts to hit its stride. For a start, it can work in any colour space, including RGB, Lab, Greyscale and CMYK. In fact it can offer an end-to-end CMYK workflow, with ICC colour management, which will make it especially attractive to publishing professionals looking for an affordable Photoshop alternative. Affinity Photo has always been able to open and edit Photoshop PSD format files, but version 1.5 brings a PSD ‘write-back’ feature. This means you can round-trip your edits to programs that use PSD files as their base format. There are features in Affinity Photo like live filter layers that won’t translate into the PSD format, and these will be simplified into raster (bitmap) layers, but as long as you’re aware of this, the new PSD write-back feature could prove a major boon. Apart from PDS files and its own native file format, Affinity Photo supports JPEG, TIFF, PNG, EPS, PDF and SVG files. Once you’re in the main Photo persona, things will start to look quite familiar to those who’ve already used Photoshop. Down the left side of the screen is a vertical toolbar with a wide range of editing and retouching tools for dodging and burning, cloning and patching and making selections. The Inpainting tool is especially interesting because it allows for quick and effective object removal. You simply paint over the object you want to remove (you can change the brush size and hardness) and Affinity Photo will replace it with surrounding details and textures. With smaller objects it works brilliantly. Larger objects can be more troublesome, but you’d expect that, and the Inpainting brush is at least as effective as any other content-aware object removal tool I’ve used. 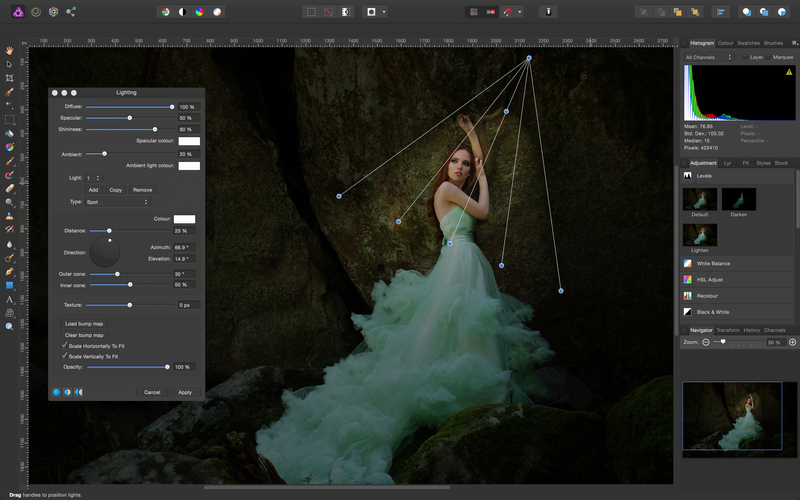 Affinity Photo 1.5 has selection, masking and layer tools to rival Photoshop’s. Otherwise, image adjustments and enhancements are carries out using non-destructive Adjustment layers. The principle is the same as Photoshop’s – by using Adjustment layers you can stack enhancements, re-order them, apply masks and go back and change the settings at any point. You can use these to adjust levels, curves, black and white conversion, white balance, hue saturation and lightness, shadows and highlights, lens filters, selective colour and a whole lot more. Some enhancements and effects require different blending modes, and these are accessed via a drop-down menu on the layers palette. The difference here is that the effect is previewed live even as you scroll through the list, so you can see which works best even before you commit to it. This lighting effect is applied as a non-destructive Live Filter which can be re-edited at any time. It doesn’t stop there. Affinity Photo also offers a range of Live Filters which operate in the same, non-destructive way. These include a whole selection of blur filters, including Elliptical and Tilt Shift depth of field blur, Clarity, Vignette, Perspective filters and other effects. These are in addition to a selection of regular ‘destructive’ filters much like those in Photoshop. Affinity 1.5 adds two new ones – Dust and Scratches for quickly removing defects from small areas, and a Halftone filter with monochrome, colour, circular and line halftones. Affinity Photo’s Live Filters are almost but not quite like Photoshop’s Smart Objects – though Smart Objects can also work with external plug-ins. This is one area where Affinity Photo still has some catching up to do. As yet, third-party plug-in publishers are not yet including Affinity Photo in their installer packages, so although it is compatible with Photoshop plug-ins, you will have to manually navigate to your existing plug-ins folders to locate them. I found that tricky because the Affinity Photo navigation dialog does not show the Library folder hidden by default by the Mac OS, and that’s where my plug-ins are. Other users don’t seem to be reporting any problems, though, and there’s no doubt that plug-ins will be just as important to Affinity Photo as they are to Photoshop and other apps – it has a smattering of ‘arty’ effects of its own, but can’t come close to the tools in the Google Nik Collection or other big plug-in suites. Serif does say that the majority of third party plug-ins now work correctly (there were some issues previously). 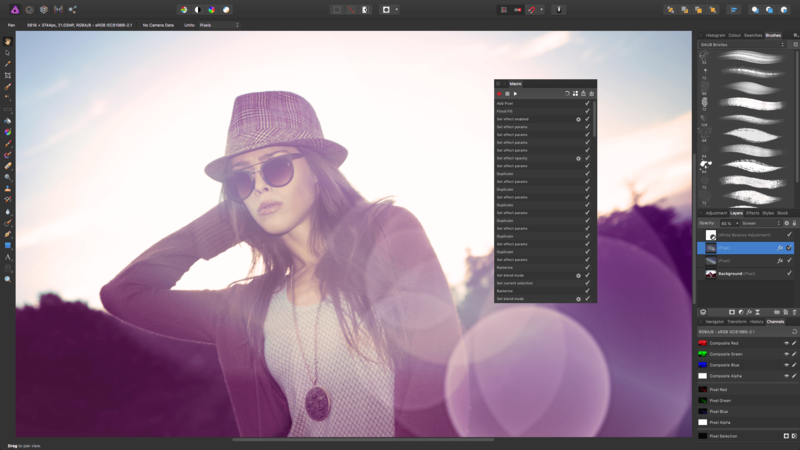 Affinity Photo 1.5 has numerous image merging capabilities, including panorama stitching. Affinity Photo is very powerful in other areas, though, particularly those which involve image blending and compositing. 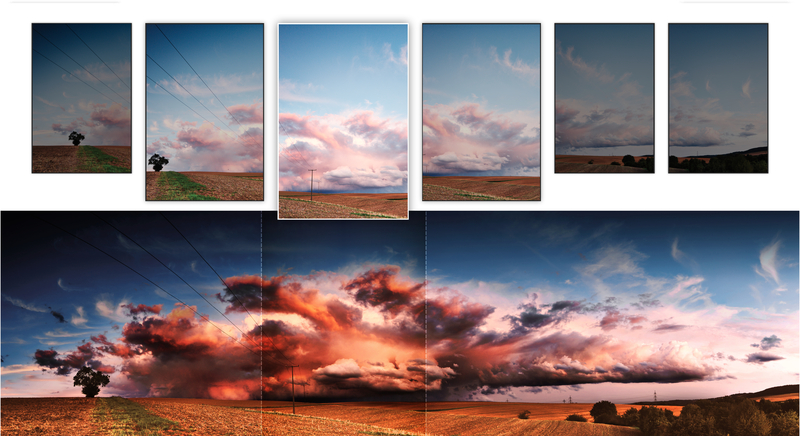 Adobe kicked off this whole area with its Photomerge technology, but Affinity Photo takes this a few stages further. It can stitch panoramic images, for example, using automatic alignment and perspective correction for each frame, but it can also do this with individually developed and tone-mapped images (I’ll come back to the tone mapping shortly). The new Focus Merge (a.k.a. focus stacking) feature can combine multiple macro shots at different focus distances to create depth of field impossible with an single exposure. It also supports Image Stacks and the merging and blending of multiple photos based on the same scene, so that you can create composites using or removing differences between frames. Related to this is the new Focus Merge option – or ‘focus stacking’, in other words. This is commonly used in macro photography, where depth of field is very shallow, to merge a whole series of shots taken at slightly different focus points into a single image with full near-to-far depth of field. This isn’t confined to macro photography – you could also use it for landscapes with important foreground detail close to the camera, say. Affinity Photo 1.5 also brings a built-in HDR merge feature. This works just like standalone HDR apps, taking a series of bracketed exposures, merging them in a 32-bit editing space and offering both preset HDR effects and manual HDR tools for creating your finished ‘look’. The new Tone Mapping persona in Affinity Photo 1.5 offers nice HDR presets, quick and easy manual controls and works in conjunction with the new HDR Merge feature – or on single images. 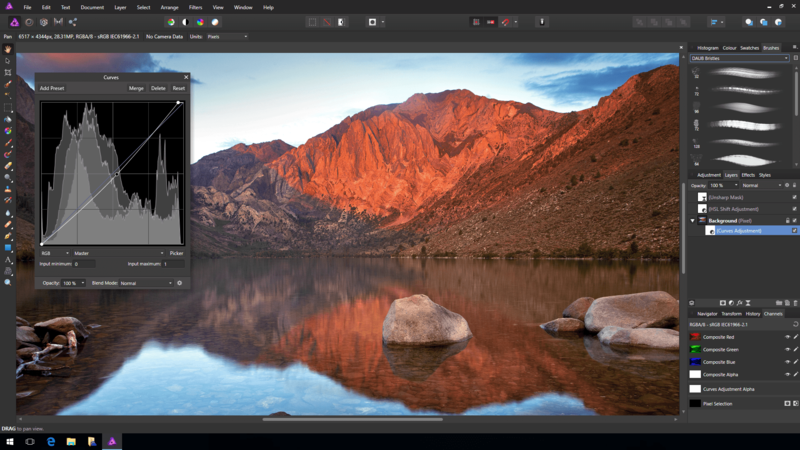 It works well (certainly a lot better than Photoshop’s equivalent) and although other standalone HDR programs offer more controls and presets, Affinity Photo might well be good enough for many users. It can handle any number of bracketed source images and any type of image file, including raw, and it takes you straight into Affinity Photo’s new Tone Mapping persona. This is where you choose and adjust the HDR effect, working with images in a 32-bit HDR space for maximum tonal range, and although the initial Tone Map can take a few moments to render, subsequent adjustments are quick and easy. In fact, the Tone Mapping persona can be used in single images too, restoring shadow and highlight ‘punch’ that’s difficult to reveal using other tools. You could, for example, prepare a raw file with the best possible brightness range in the Develop persona and then work on it in the Tone Mapping persona. It’s even effective at adding life to dull-looking JPEGs straight from a digital camera, as long as you don’t get too greedy with the adjustments – JPEGs are 8-bit files, after all, not 16-bit or 32-bit. Affinity Photo 1.5 has one more clever new image stacking/merging feature – the ability to use a number of other images as clone sources. The Affinity website has a good example in a video tutorial, where the photographer adds passers-by from a number of frames to make a scene look busier. You can now record macros to automate a series of editing tasks, including the ability to stop the macro for user input for custom slider settings or options, for example. This is backed up by a new Batch Processing option which can carry out generic bulk actions like resizing or changing the format of a folder full of images, or editing actions saved as macros. You can now automate complex image effects with macros and apply them to multiple photos with the new batch processing options. It’s now possible to edit 360-degree images shot by 360 cameras or stitched from individual frames. You can pan and zoom around the image ‘live’ and edit and retouch them. Affinity Photo now supports the new MacBook Pro TouchBar too, and in addition to the six extensions already installed for Apple Photos (Develop, Haze Removal, Liquify, Miniature, Monochrome, Retouch), Affinity Photo 1.5 now adds full-round-tripping – you can open a picture in Affinity Photo for editing, straight from Apple Photos, and have it returned to your library when it’s finished. Mac owners still get special treatment. In addition to the six Apple Photos extensions already available, it’s now possible to round-trip photos to the full Affinity Photo 1.5 editor. 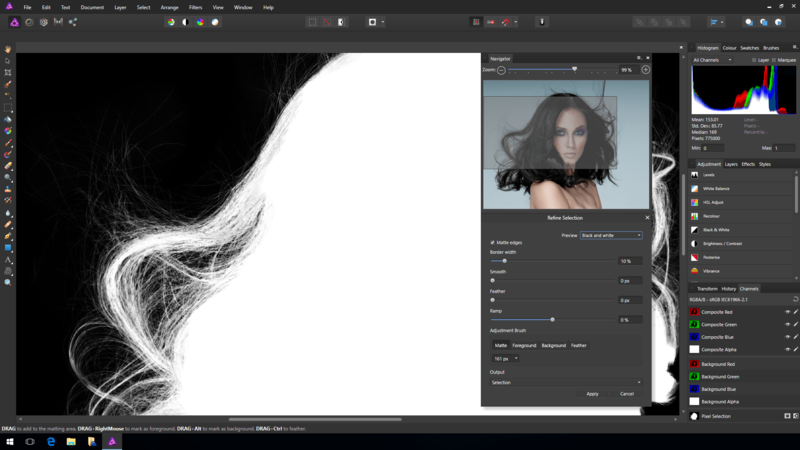 There’s a lot to praise in Affinity Photo 1.5 (as you’ve probably noticed), but there are some rough edges too and it’s worth point out its limitations – not limitations within the software, but in what it’s designed to do. One of the reasons for this Life after Photoshop site, and indeed for having programs other than Photoshop, is that Photoshop doesn’t do everything. It’s brilliant at powerful, precise, in-depth image manipulation and compositing, but it doesn’t care about organising your photos (that’s Lightroom’s job) and it’s not interested if off-the-shelf preset effects (that’s what plug-ins are for). Affinity Photo is the same. It’s not quite as good as Photoshop in some respects, better than Photoshop in others and both a heck of a lot cheaper and a heck of a lot more appealing to those who don’t like being asked to ‘rent’ rather than own their software. But it suffers from the same slightly narrow approach to image-editing and photography. It assumes everyone is a technician and works hard on single images at a time. Many of us aren’t, or are looking for an appealing or evocative ‘look’ that lies beyond the capabilities of programs like Affinity Photo or Photoshop. Actually, in fairness, you could probably achieve many of the ‘looks’ of plug-in suites like the Google Nik Collection using Photoshop or Elements, some complex compositing and adjustments, external texture files, blend modes and more and bundle them up into one-click macros – but that would mean A LOT of work, expertise and resources. Of its type, Affinity Photo is a powerful, brilliant and cheap program which is evolving at breakneck speed. It just may not be the type of photo-editing software you’re looking for. And while there’s a lot here, there’s also a lot to learn. Affinity Photo has its own way of doing things and you might sometimes be disappointed at an outcome without realising a few of the tricks and wrinkles you need to know to get the best from it. Affinity Photo 1.5 is powerful and versatile – it can apply this tilt-shift effect non-destructively, for example – but at heart it’s still a deep, technical, image manipulation tool of the old school. There is no trial version, but at this price there’s hardly a great deal to lose by buying it. What I would recommend, though is that you set aside a couple of hours for the extensive range of video tutorials on the affinity.serif.com website. They explain the key processes in plain English and deliver a clearer understanding of what this program can do, and how to do it, than you’re ever likely to get by experimenting on your own. The major drawback of AP? It completely lacks support for IPTC metadata. You can’t neither read nor edit it from within the app. Even worse, the .afphoto file format is proprietary and kept secret (different to .psd), thus no 3rd party editor (aka image management software) may access the metadata. There is no appropriate way to keep a collection of .afphoto files organized. Too bad. Absolutely correct. It’s a wonderful and affordable resource for specific fixes and tweaks that can’t be done in Lightroom. I love the new focus stacking feature and have done a number of head and eye swaps for group shots. I look forward to seeing where it takes my photography. For $40… an easy decision. Am curious why there is no “Contact Us” on Affinity website. Perhaps I can get some info here. My OS is ML, 10.8.5. I have associates who are still running OS 10.6.8. How far back (Mac OS) will Affinity apps run? Will Affinity Design (AD) open InDesign documents, then saving as AD docs? When InD was first launched, it opened Quark files which could be saved as InD docs. Thanks much Rod for your reply. I did pose those questions on Affinity forum with no replies. However, I opened a Pandora’s Box attempting to DL the “Free (? )” 30 day trial version of Affinity Photo. It DL the real app and billed me thru App store! I immediately disputed the charge with the app sitting on my desktop. Am hoping they will rectify this. That bargain price of £29.99 didn’t last long, it’s now £48.99. But I’ll certainly be keeping an eye on it as a prospective future purchase when I get fed up with Lightroom grinding along! What would you recommend for Fuji X files, being an amateur photographer. Im considering Photo Ninja, Alien Skin, Affinity, or maybe Lightroom 6 as standalone. I know there are more, but it seems that people love these ones most at least for Fuji (where Capt 1 is too exppesive). I need to do quick Batch editing a lot, i love to be able to use presets/ comparable with Fuji’s simulations. I know Alien Skin had a lot, but if Affinity or Photo Ninja have also an option, albeit not as many that would be ok too. I haven’t tried all of the programs on your list, in-depth, with Fujifilm RAF files, but my pick would be Lightroom. It has Camera Calibration presets which match Fujfilm’s own film simulations very well indeed and it’s built for painless batch processing – bear in mind, though, that Lightroom does not apply luminance noise reduction by default – you’ll need to dial in a little luminance noise reduction to match the results you get from the camera. I recently started with Affinity Photo 1.6 in order to replace my old CS5 although I don’t do editing often. In most cases, Capture NX 2 or NX-D combined with Nik Collection are sufficient. I was tempted by a 30% discount on the already very affordable price tag. I am astonished how similar initial RAW rendering is compared with Nikon’s RAW converters. As I am in portraiture almost exclusively, I am particularely focused on skin tone retouching with frequency separation.